The 17-inch alloy wheels and aggressive-looking trim pieces come standard on the iM. In its quest to attract buyers to its new compact, Scion has just one chance to get this right. The iM that makes its debut as a 2016 model comes in a single body style, a lone trim level, and with one engine. 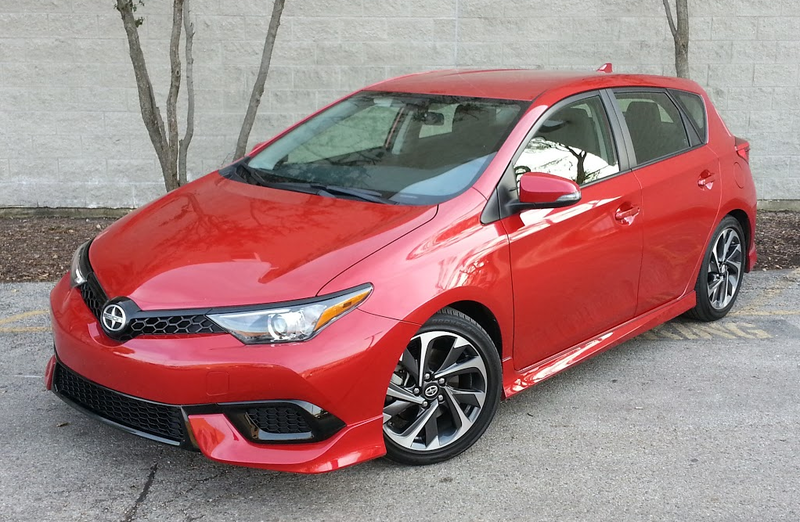 Fortunately for Toyota’s “youth brand,” the 4-door hatchback iM presents itself as a singularly good deal. There’s room enough for four passengers in the iM, though tall rear-seat riders will wish for a little extra knee space. Cabin materials are a little nicer than most folks might expect in a $20,000 car. The $19,200 starting price of the example that Consumer Guide® tested included the 1.8-liter 4-cylinder engine and CVT continuously variable automatic transmission (with a 6-speed manual gearbox the iM costs $18,430), automatic climate control, cruise control, automatic projector-beam headlights, heated power-folding mirrors with integrated turn-signal lamps, remote keyless entry, rearview camera, a 4.2-inch multi-information display in the instrument cluster, a 7-inch dashboard touchscreen, Bluetooth audio and phone, voice recognition, text-message feature, Aha app, and an audio system with automatic sound leveling keyed to vehicle speed. Black-highlighted alloy wheels shod with 225/45R17 tires, chrome exhaust tips, and a lower-body aero kit give the iM a sportier look than most low-cost cars tend to get. Also, unlike with some other cars, it’s hard to get too carried away cost-wise with the iM. Apart from the choice of transmission, there are no factory options—only dealer-installed goodies that include a navigation system and some dress-up items. Designed into the iM package are decent passenger room and a few interior trim and appearance touches that belie the low price. Depending on where the front passengers set up, rear leg room runs from merely OK to pretty good for a small car. With the help of an extremely minimal central tunnel, three consenting adults could squeeze into the back seat. Rear head room is fine, but not quite as good as in front. Vision suffers only at the rear corners, where the roof pillars are fairly thick. There’s not a lot of space behind the 2nd-row seats, but they do fold flush with the floor to open up a usefully roomy cargo hold. There’s generous distribution of cloth and spongy plastic surfaces on the doors and dash. However, while the plastic atop the front doors has some give to it, the same area on the rear doors is stiff. Drivers grip a leather-wrapped steering wheel and are treated to a padded area where their right knee is most likely to make contact with the center console. A dead pedal gives them a place to comfortably rest their left foot. Bright highlights and a strip of light-gray stitched leatherette on the lower dash lighten up what would otherwise be monotone sameness. The texture of the seat cloth feels a little industrial, but the intermittent-dash pattern and white contrast stitching make for a pleasing appearance. 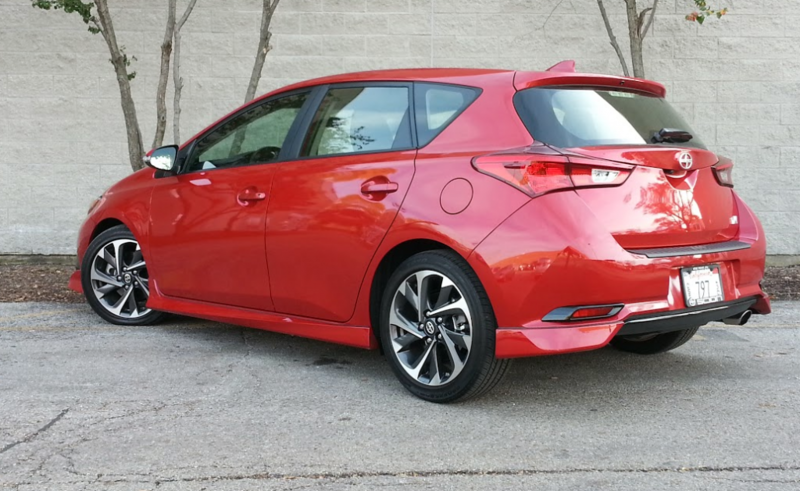 Indeed, the iM’s front-seat area will seem familiar to anyone who has been in a 2014 or newer Toyota Corolla. The flat-faced presentation of the instrument panel is changed in detail from the Corolla, but its basic shape and layout are the same. Drivers are confronted by tachometer and speedometer dials on either side of the vehicle-information display. (The info read-out is pretty clear, but graphics on the two main dials strike this tester as being a bit small.) At the very center of the dash is the touchscreen that displays audio settings, the back-up-camera view, and—when equipped—navigation. Below this are climate controls with a small group of function buttons and flipper switches that set temperature, fan direction, and fan speed. Storage space in front consists of a covered console box that’s deep but not long, two open cup holders, a small covered bin with a power plug and USB/auxiliary ports in front of the shifter, and a fairly roomy glove box. Rear storage is confined to a pouch on the back of each front seat, and twin cup holders in the pull-down center arm rest. All four doors sport built-in bottle holders; the front doors have short storage pockets too. The rear cargo area will hold a small family’s weekly groceries or a couple of people’s weekend luggage. There’s some small-item space under the floor in a segmented tray atop the spare tire, and in a couple of open bins at the far sides of the cargo bay. Rear 60/40-split seats fold flat in an unbroken surface from the cargo area. At least the automatic provides some additional operating thrift. Where the manual iM is rated by the EPA and 27 mpg in the city and 36 mpg on the highway, the CVT-equipped car’s numbers are 28 and 37, respectively. Tooling around in the standard setting for 158 miles (75 percent in city conditions), this driver averaged 31.0 mpg—not far off the EPA combined city/highway estimate of 32 mpg. As for ride, the iM is no Lexus ES, but it’s pleasantly compliant for a small car. There was a surprising absence of choppiness over bumps. Steering—with electric power assist—is easy, and cornering lean is well controlled. 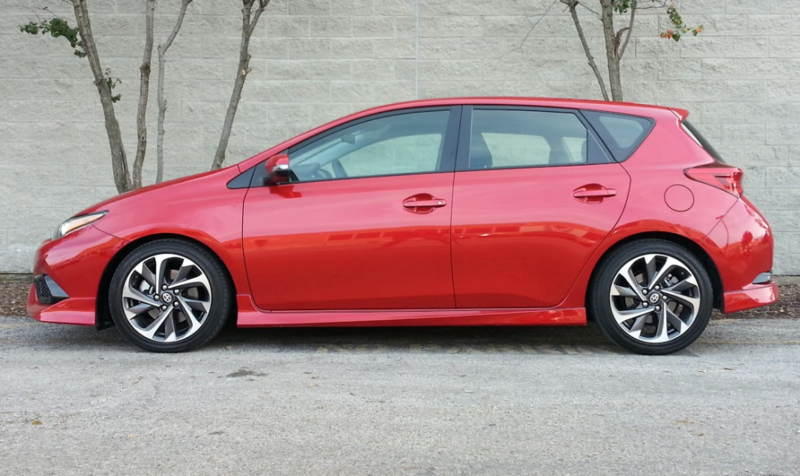 However, there are plenty of compact cars that best this Scion in the fun-to-drive department. Despite its racy-looking wheels and sporty body kit, the iM’s cornering prowess and overall agility comes up short compared to, say, a Mazda 3 or a Ford Focus. Still, from a features-per-dollar, style-for-the-money, and all-around-value standpoint, Scion’s new 4-door hatchback is hard to beat. The iM isn’t perfect, but it represents a strong value for around $20,000. 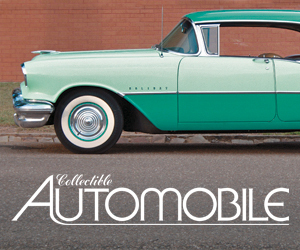 Shoppers seeking economical, stylish transportation may want to check the iM out. Written by: The Daily Drive staff on December 21, 2015.on February 6, 2018.